This website is absolutely incredible! Sad, I was not aware that Taki had passed away. I knew Hisashi Takimoto back in the eighties as we both members of the same Buddhist Organization. Brian Takimoto as we knew him at the Buddhist center (of course everyone called him Taki) was just a great, great person. One memorable experience that I shall always cherish is a trip that we made to Dallas, Texas together to help build a stage for a Buddhist function. Another member (Pistol Pete) and I drove a tractor/trailer loaded with tree bark slats to be used on the stage. Taki was sent along with us in the truck as spiritual adviser. 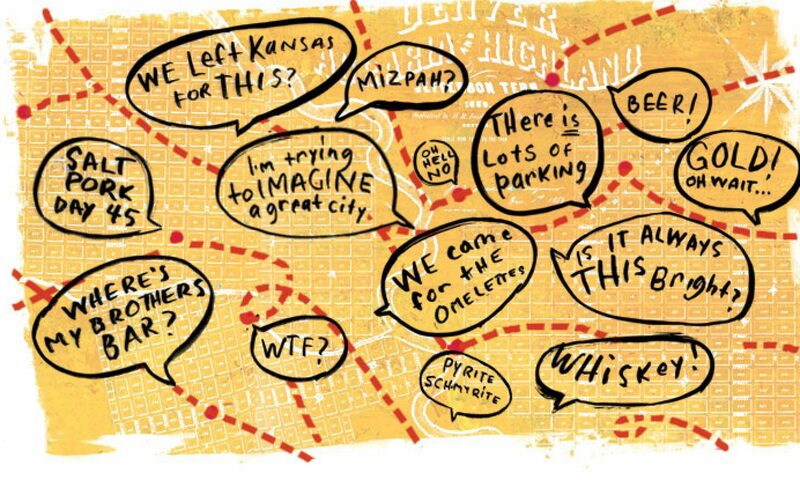 Shortly after that trip I had moved from Denver to California. The last time I saw Taki was back in the early nineties as I was in Denver for work-related training. I heard that he had open a restaurant on East Colfax (the first place, the one that caught on fire), so I decided to surprise him by stopping in unannounced to have lunch. He wouldn’t let pay for my meals the entire week that I was there. Sorry to say that Taki’s restaurant has now closed. I know that the new owner had worked hard to keep it going. I remember back in the late 1970s there was a Beef Bowl Restaurant (a fast-food Japanese place) at that same location. When Taki had moved into the current location, I remember him being pleased that there had been a Japanese restaurant there before. 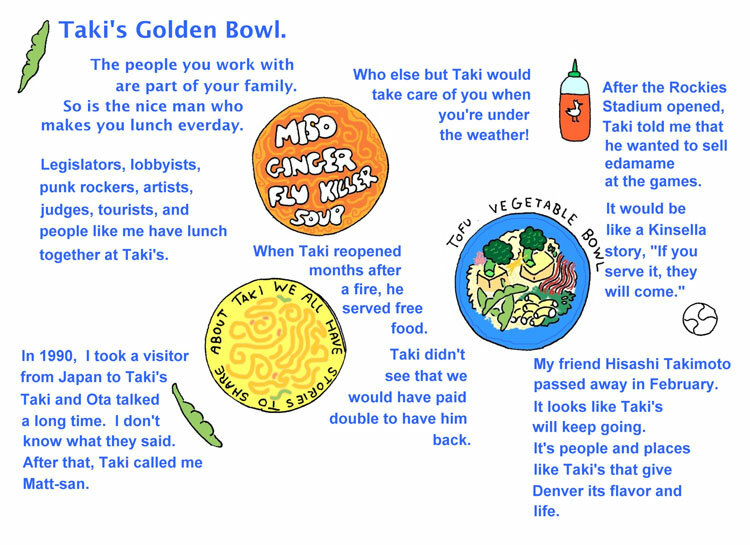 Taki’s will be missed by many of us, but let’s hope that something new and interesting will take its place. I visited Taki’s when it first started across the street (orange front) where another restaurant is not next to the corner store. He was always friendly and served a fair amount of food for the price. A few days before he died he gave me a cake of soap, which I still have. Too bad the guy who took it over had no clue how to keep it going. I miss Taki. 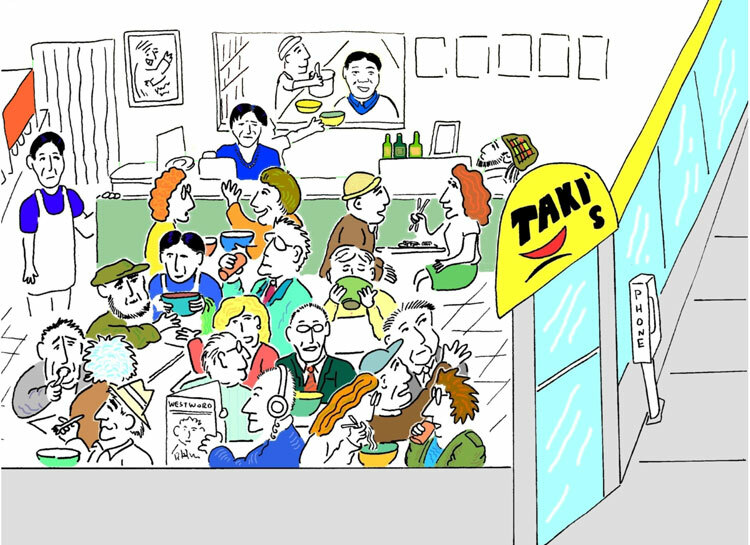 Taki’s was my favorite restaurant for years. The food was terrific and reasonably priced. Taki always greeted me personally and checked on me as I enjoyed my meal. He recommended a lot of interesting food (sea anemone for example) which was always delicious. He employed people who needed employment and I personally saw him give free meals to needy people many times. Wonderful guy, he and his great restaurant are missed. Wherever heaven is he is surely there cooking Japanese food.